Since 2013, internet penetration rose by more than 20 percentage points to 84% of all nationals. 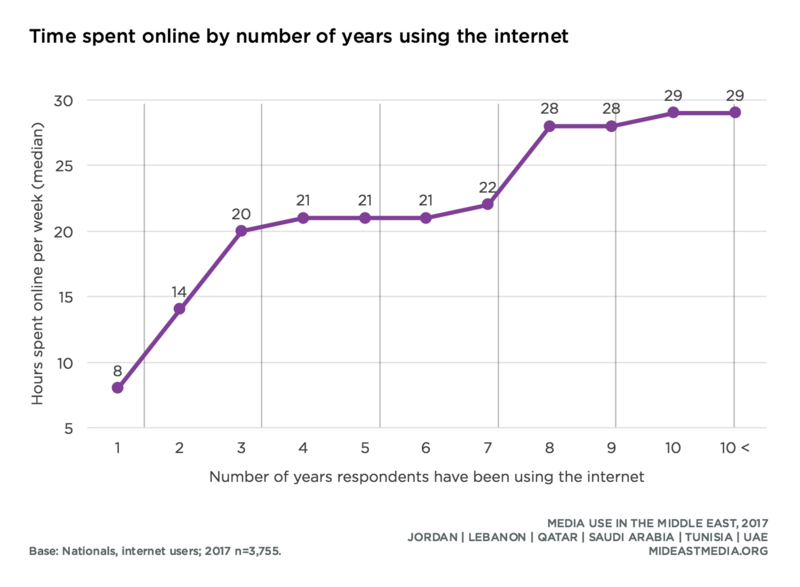 The most dramatic increases in internet use are seen in Jordan and Lebanon (Jordan: 33 percentage point increase; Lebanon: 33-point increase). 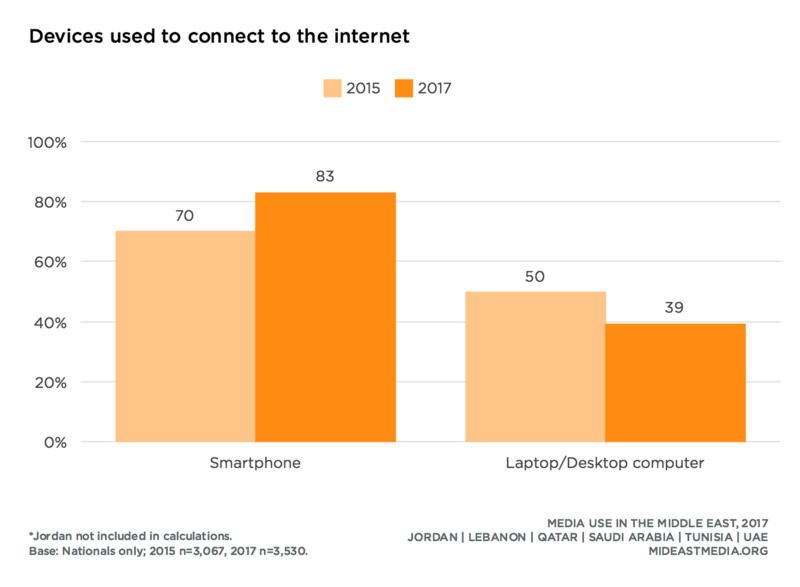 Currently, over nine in 10 nationals in Lebanon, Qatar, Saudi Arabia, and the UAE use the internet, while internet penetration is lower in Jordan and Tunisia despite significant increases in use over the past five years (2017: 80% Jordan, 68% Tunisia). The most educated respondents (university or higher) are three times more likely to use the internet than respondents with the lowest level of education (97% university or higher vs. 31% primary or less). The youngest age cohort is nearly four times as likely as the oldest cohort to use the internet (96% 18-24 year-olds vs. 25% 60+ years-old). Nationals report that they have been using the internet for an average of 7.6 years, but this varies by country from about five years in Jordan to 10 years in Qatar and the UAE (5.3 years in Jordan, 6.4 in Tunisia, 8.0 in KSA, 8.6 in Lebanon, 9.7 in Qatar, 10.2 in UAE). Time spent online correlates positively with the number of years using the internet. Nationals new to the internet (1 year) spend about eight hours a week online. This jumps to 14 hours per week for those who have spent two years using the internet and again rises to about 21 hours per week among those who have been online between three to seven years. Those with 10 or more years of internet experience spend about 29 hours per week online. 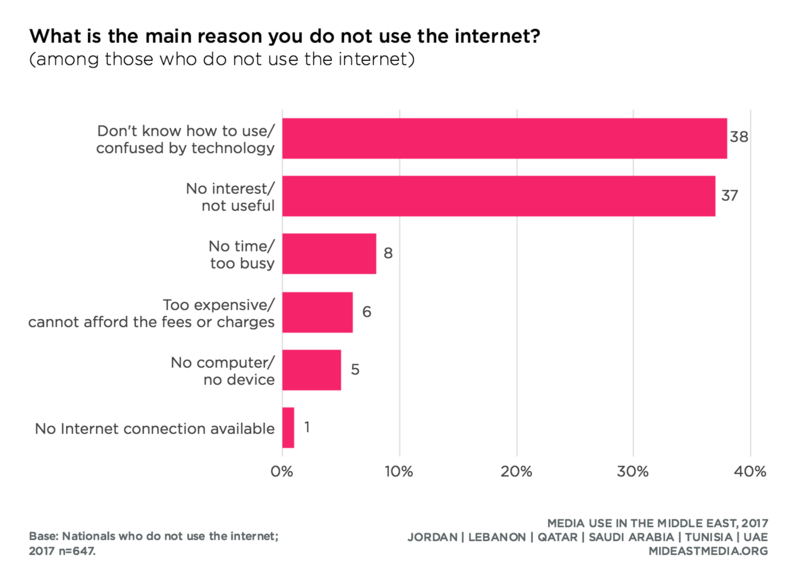 The small number of nationals who are not online cite two main reasons for not using the internet: 1) they do not know how to use it, or 2) they are not interested in using the internet/don’t see a use for it (38% do not know how to use it/confused, 37% not interested/not useful). Lack of access does not appear to be a major barrier to using the internet (1% no internet connection, 5% no computer/device, 6% too expensive, 8% too busy/no time). Since 2015, nationals are turning away from traditional computers and laptops to connect to the internet and are increasingly using smartphones.The percentage of nationals using smartphones to connect to the internet rose by 13 percentage points from 2015 to 2017, while the percentage using laptops or computers fell by 11 percentage points. More than nine in 10 nationals in Lebanon, Qatar, Saudi Arabia, and the UAE use smartphones to connect to the internet, but fewer do so in Tunisia (63%). On the whole, tablet use remained stable from 2015 to 2017 but declined sharply in Qatar and the UAE (national average: 22% in 2015 vs. 23% in 2017; Qatar: 34% in 2015 to 18% in 2017; UAE: 50% in 2015 to 37% in 2017). A majority of nationals throughout the region use the internet to check email, but while use of the internet for other purposes increased by 10 to 20 percentage points from 2013 to 2017, the number of people checking email has remained static (56% do at all in 2017 vs. 55% in 2013). Checking email is now one of the least common internet activities along with playing games (54% play games at all). About eight in 10 nationals make or receive calls online, check what friends and family are doing, and download or watch videos (77% make or receive calls, 80% check on friends and family, 77% watch or download videos). Seven in 10 nationals gather news and information or listen to or download music (73% news, 74% health, 70% religion, 68% music). The share of respondents who make or receive calls, get health information, and watch or download videos online at all rose over 20 percentage points since 2013 (calls: 52% 2013 vs. 77% 2017; health information: 51% 2013 vs. 74% 2017; videos: 50% 2013 vs. 77% 2017). All other categories (except checking email) rose by at least 10 percentage points. For daily online activity, about two-thirds of nationals check in with friends and family (64%); more than half of nationals make or receive calls online every day, nearly double the 2013 rate (54% 2017 vs. 28% 2013). 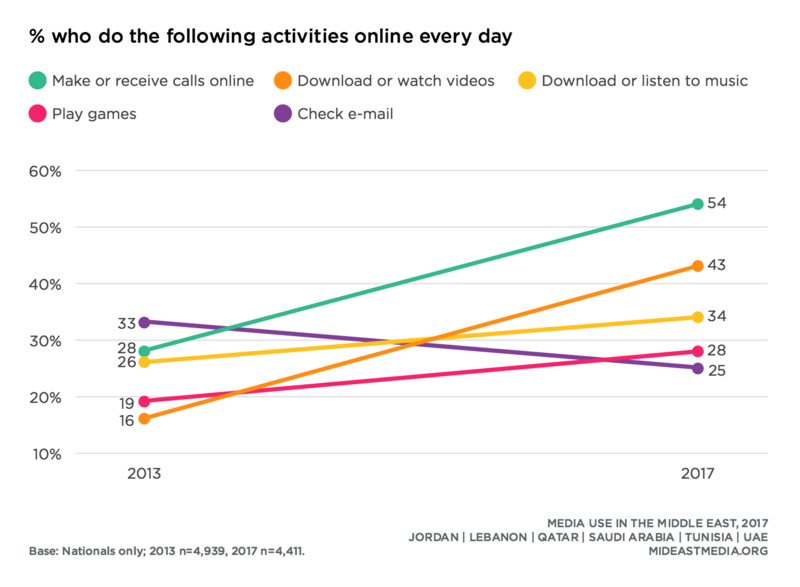 Daily use of the internet to make or receive calls ranges from three in 10 in Jordan to more than eight in 10 in Lebanon. 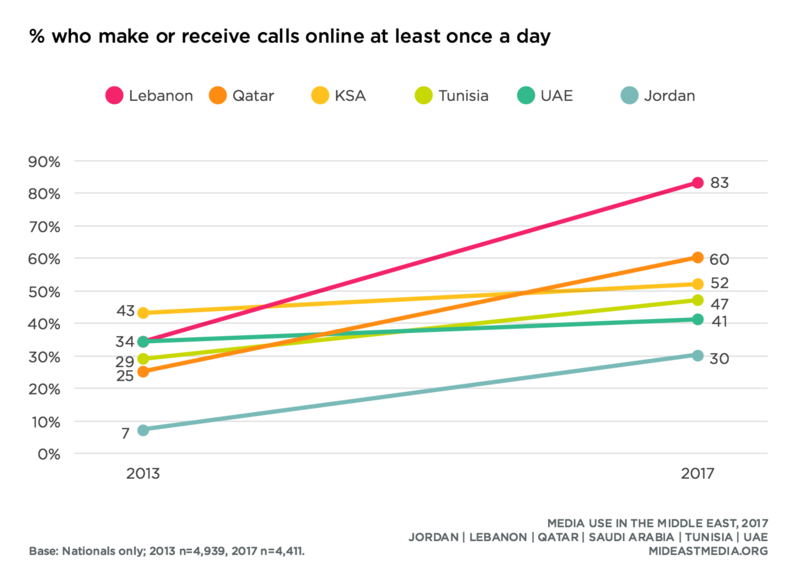 In Jordan, Lebanon, and Qatar, making and receiving online calls daily increased dramatically since 2013—more than 20 percentage points. Four in 10 nationals look for news online on a daily basis, and two in 10 search for health and religious information every day (41% news, 21% health, 22% religion). This represents a 13 percentage-point increase for news and seven-point increase for health since 2013 (religious information was not included in the 2013 survey for comparison). Nationals are also consuming more entertainment online. The percent of nationals who download or listen to music or play games daily increased by nearly 10 percentage points from 2013. Nearly one in three nationals do these activities every day (34% download/listen to music, 28% play games). Daily online activities vary more by education than by age. 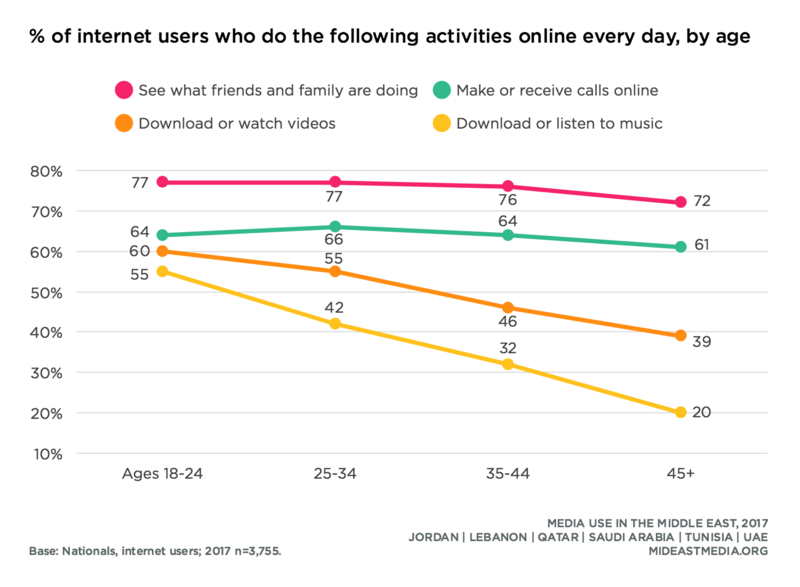 Looking for information (news, health, and religion) along with checking in with friends and family and making or receiving calls vary little by age. However, age does play a role in online entertainment. Among internet users, half or more of the youngest respondents (18-24) consume videos or music or play games online daily—about double the rate of the oldest group (45+). Internet users with higher levels of education are more likely than those with less education to search for news online. Educational differences apply less to information-seeking of health and religious content, for which the lowest (primary or less) and the highest (university or greater) education groups search equally. Online socializing varies considerably by education. University-educated internet users are far more likely than those with a primary education or less to check in with friends and family or make or receive calls online on a daily basis. Compared to internet users with lower levels of education, highly educated internet users also use the internet more frequently to watch videos and listen to music, but playing games does not vary consistently with education. Across the region, one in 16 nationals say they worked toward a certificate or degree by participating in an online course or job training in the past year (6% online course, 6% online job training). Saudis are a notable exception. Fourteen percent of Saudis took an online course and 15% participated in online job training in the past year. Participation in online courses and job training is highest among the youngest age group (online course: 10% 18-24 year-olds, 7% 25-34 year-olds, 4% 35-44 year-olds, 2% 45+ year-olds; online job training: 10%, 8%, 4%, 2%, respectively). Education also plays a role. 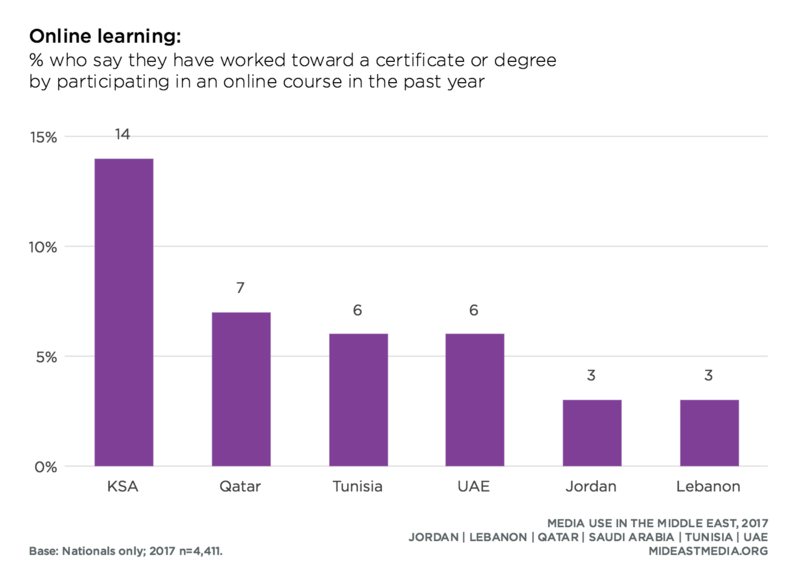 One in 10 university-educated nationals have participated in an online course or job training in the past year compared with only 2% of those with a primary education or less. For some users, the internet helps to increase contact with people who have both similar and different viewpoints. 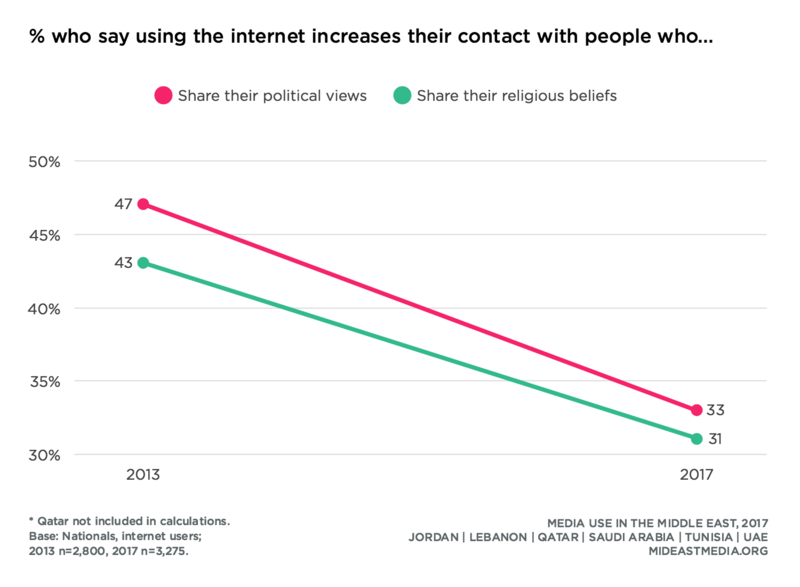 About one in three internet users say the internet increases their contact with people who share their political and religious beliefs, a drop from 2013 (share political beliefs: 47% in 2013 vs. 33% in 2017; share religious beliefs: 43% in 2013 vs. 31% in 2017). Additionally, nearly one in four nationals say the internet increases their contact with people who hold political and religious beliefs different from their own (23% different political beliefs, 24% different religious beliefs). This pattern varies considerably by country. 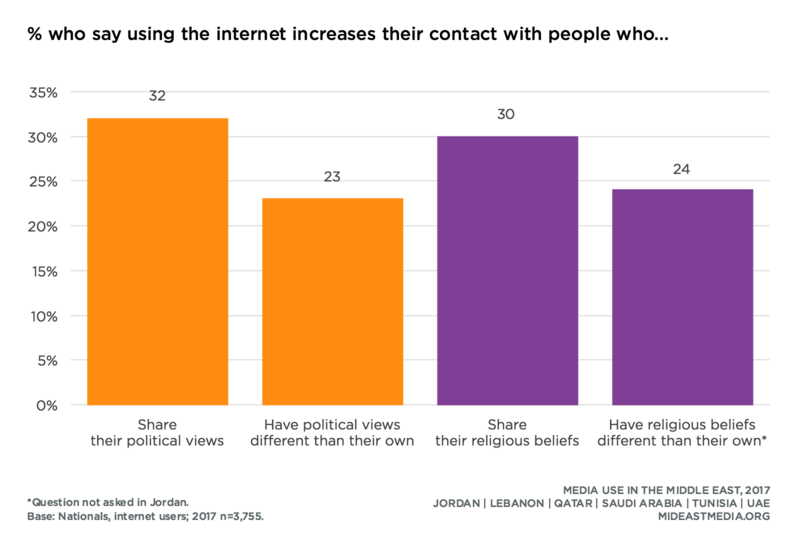 Saudi internet users, for example, are by far the most likely to say the internet increases their contact with people who have similar views as their own about politics and religion (KSA: internet increases contact: 57% similar political views, 53% similar religious beliefs). In contrast, less than one in five Tunisians and Emiratis say the internet increases their contact with others who hold similar political or religious viewpoints (Tunisia: 16% similar political views, 14% similar religious beliefs; UAE: 17% similar political views, 18% similar religious beliefs). Additionally, nearly half of Saudi internet users say the internet increases their contact with people who have views about about politics and religion that are different than their own, compared with one in 10 Tunisians and Emiratis who say the same (internet increases contact: KSA: 48% different political views, 46% different religious beliefs; Tunisia: 9% different political views, 11% different religious beliefs; UAE: 9% different political views, 10% different religious beliefs). More highly educated internet users (secondary education or higher) are twice as likely as those with the least education (primary or less) to engage online with people who have viewpoints on religion and politics that are similar to their own. Higher-educated internet users are also more likely than those with less education to engage online with those who have different viewpoints on religion and politics compared with their own views. Internet users who define themselves as progressive are more likely than self-defined conservatives to encounter people online with political views both similar to and different from their own (similar political views: 40% progressive vs. 28% conservative; different political views: 32% progressive vs. 20% conservative). While progressives and conservatives connect with people of like religious beliefs at similar rates, progressives are more likely than conservatives to engage online with people of different religious beliefs (similar religious beliefs: 33% progressive vs. 31% conservative; different religious beliefs: 29% progressive vs. 21% conservative). Internet users who believe the internet affords political efficacy are at least three times as likely as those who do not hold this view to interact online with people who have both similar and dissimilar political beliefs (similar political views: 58% agree internet affords political efficacy vs. 8% disagree; different political views: 46% agree vs. 13% disagree). Internet users who attend religious services weekly or more are more likely than those who do not attend services to say the internet increases contact with people sharing their religious beliefs (similar religious beliefs: 33% attend weekly services vs. 25% attend less than once a year or never). Comedy and news are the most popular genres watched by nationals in a typical week both online and on TV (online: 60% comedy, 55% news; TV: 67% comedy, 67% news). What is notable, though, is the shift in viewership by medium over time. The percentage of nationals watching comedy online jumped 45 percentage points from 15% in 2013 to 60% in 2017, yet rose only six points for TV (61% in 2013 vs. 67% in 2017). In comparison, the percent who watch news on TV declined by 20 percentage points from 87% in 2013 to 67% in 2017, while online viewership increased by 16-points from 39% in 2013 to 55% in 2017. Nearly half of nationals watch social satire online, and four in 10 watch sports and religious/spiritual content online (47% social satire, 39% sports, 39% religious/spiritual). This represents a 27 percentage point increase for religious and spiritual content online and an 18-point increase for sports online compared with 2013 (social satire was not included on the 2013 survey for comparison). 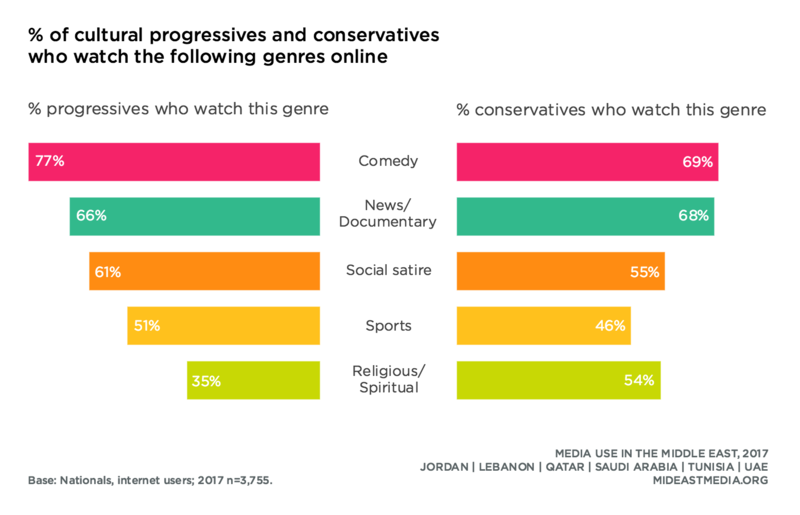 Conservative nationals consume more religious content than progressives, both on TV and online (TV: 58% conservative vs. 37% progressive; online: 54% conservative vs. 35% progressive). Progressives, on the other hand, watch more comedy, social satire, and sports than conservatives on both platforms. More men than women watch news and sports online (news/documentary: 60% men vs. 51% women; sports: 60% men vs. 19% women). Women watch more comedy on TV than men, but both watch comedy online at similar rates (comedy on TV: 70% women vs. 63% men; comedy online: 59% women vs. 61% men). The youngest respondents (18-24) are least likely to watch news on TV (52% 18-24 year-olds vs. 81% 45+ year-olds). 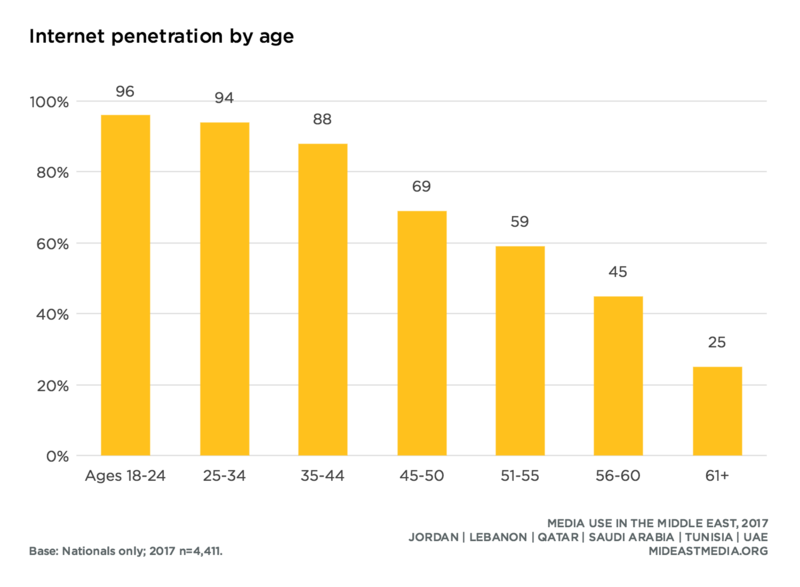 Online news consumption varies less by age, but the youngest group is also less likely to watch news online (60% 18-24 year-olds, 69% 25-34 year-olds, 68% 35-44 year-olds, 69% 45+ year-olds, among internet users). Compared to older respondents, fewer young people watch religious programming, whether on TV or online. About one in three 18 to 24 year-olds watch religious or spiritual programming on TV or online compared with 50% or more of those 25 or older. Comedy and sports are the most popular online video genres for those under 45 years-old. About three-fourths of this group watches comedy videos online compared with 54% of those 45 years and older. About half of those under 45 years-old watch sports online compared with one-third of those 45 years and older. Nationals of all education levels watch news on TV (70% primary or less, 74% intermediate, 64% secondary, 69% university or higher). There is, however, a 30 percentage point difference between the most and least educated internet users in watching news videos online (42% primary or less vs. 61% intermediate, 65% secondary, 72% university or higher). Respondents with more education consume more comedy, social satire, and sports, both on TV and online, with a 15 to 25 percentage point variation between the most and least educated groups (comedy on TV: 53% primary or less vs. 69% university or higher; social satire on TV: 38% vs. 56%; sports on TV: 23% vs. 48%; comedy online among internet users: 53% primary or less vs. 73% university or higher; social satire online: 37% vs. 61%, sports online: 28% vs. 53%). Less educated respondents are more likely to watch religious content on TV, but are equally likely to watch religious content online compared with their more educated counterparts (TV: 64% primary or less, 53% intermediate, 46% secondary, 51% university or higher; online among internet users: 48% , 45% , 44% , 52%, respectively).